Just 250 odd kilometres from the capital of India lies a small town which goes by the name Dausa. A rather delicious name, many would say. Located near the famous districts of Alwar and Bharatpur, the town of Dausa is itself an upcoming and a very famous town in tourism circuits. The town is an emulation of the state of Rajasthan on a tiny scale. The city will let you experience Rajasthan in a very tiny area, cub is the city. Whether it be famous forts or your beloved camel rides or a safari, Dausa has it all. Here we have compiled a list of the places to visit in Dausa, Rajasthan that will let you experience the fun filled town in entirety. A Baori or a Baoli is the Hindi name for a step well. 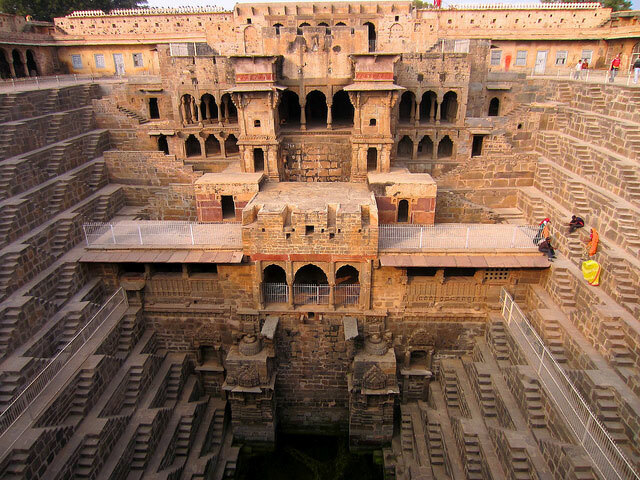 The Chand Baori is a step well in Dausa. The step well was built almost 1900 years ago, by the kings of the Chauhan Dynasty making it the oldest step well in the whole of the Asian Continent. The step well is an architectural wonder and considering its age makes it all the greater. One has to actually be there to realise the grandeur and the symmetry of the well. The well is perfectly uniform and consistent throughout. Chand Baori will appear to you like a perfect one point projection of a splendid well. This famous step well will stagger and confound you with its beauty. Next to the famous step well is another famous tourist attraction- The temple of Harshat Mata. 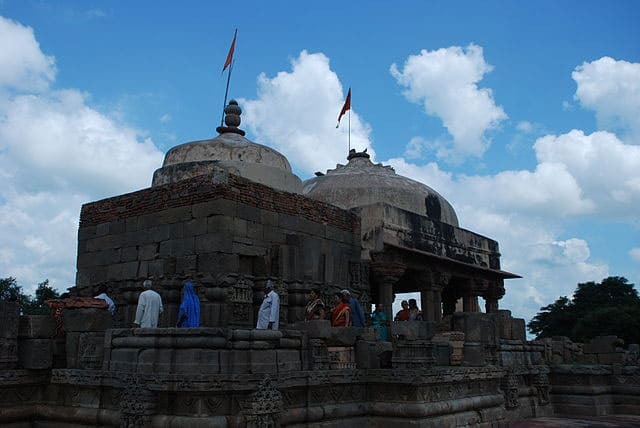 This famous temple is dedicated to the local goddess Harshat. Unlike the well, this temple has suffered the wrath of time and has been razed and destroyed by Islamic rulers who invaded the temple. Only ruins are left, but of what still remains, the temple is a great sight. With a grand open courtyard and wonderful sculptures and carvings on pillars and walls, we now can only imagine what the temple could have been like in its full glory. Though, the temple does not disappoint, I guarantee you will love the environment and the aura that the temple provides. The village of Bhandarej is bijou and a chirping hamlet-esque village in the district of Dausa. The village of Bhandarej boasts a plethora of attractions, so much so that it will leave you confused where to go and where not to. The village has gorgeous step wells and magnificent walls. But the piece de resistance is the humongous Bhadrawati Palace. A royal property the palace boasts plush rooms and green gardens. This palace will truly give you a royal and a regal experience when you spend your time there. This famous and rather spookily magical temple in Dausa is dedicated to the Monkey God- Hanuman. Located near the Mehandipur Village, this temple is known to have magical properties. It is often regarded that this temple cures mentally disturbed and people with unbalanced brains. This is the aura of the temple. Many doctors have tried and have failed to give an explanation behind this. The glistening idol of Hanuman is carved on stone and is very rudimentary in nature but appears gilded when one lays his eyes on it. The temple lures many believers and worshippers who come to the temple for their loved one wellbeing. The temple provides eerie and an adventurous experience that one cannot afford to miss. 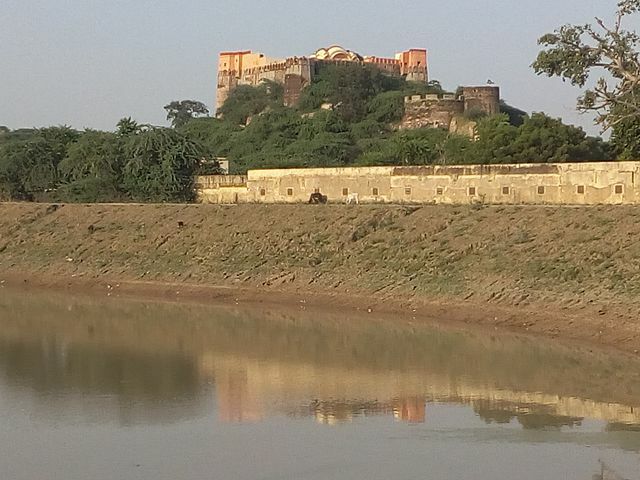 This fort was built by the king of Jaipur- Madhav Singh. Madhogarh is located on the top of a hill in the backdrop of lovely flower fields, which make it a very scenic and picturesque fort. The fort has now been converted into a royal hotel. This hotel promises a lovely accommodation to its visitors. With a grand central courtyard that has lovely local functions, one is bound to have a good time as the hotel gives you a feel of Rajasthan. Also, due to its location the hotel terraces offer a great view where you along with your family and friends can enjoy a great evening tea. The list we have compiled will let you have an exhilarating time in the city but remember the list is not exhaustive. These are the best and the top places to visit but I am sure you would find something interesting when you roam around the city with your friends. The people in Dausa are waiting for you with open arms. So, make sure you visit this hidden place to have a great time.